Featuring up to six drills, these pneumatically powered units can be mounted to an excavator, backhoe or skid-steer loader to form a self-contained and highly mobile drilling solution for full-depth repair. 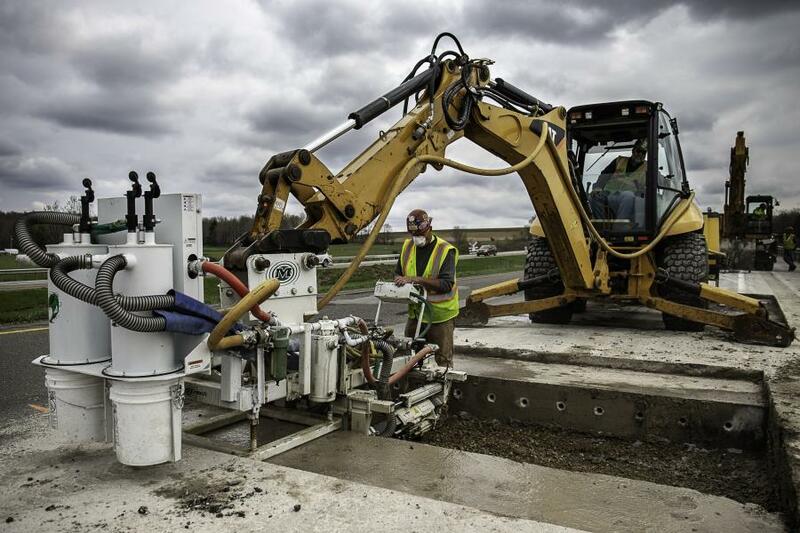 Minnich Manufacturing's A3/A6 machine-mounted drills maximize productivity and safety on patchwork jobs. Featuring up to six drills, these pneumatically powered units can be mounted to an excavator, backhoe or skid-steer loader to form a self-contained and highly mobile drilling solution for full-depth repair. Besides offering the maneuverability to get jobs done faster, A3/A6 drills provide a safer alternative for operators, eliminating fatigue by using the carrier to transport the drill. Available side-shift functionality enables operators to drill a second set of holes without having to reposition the carrier. An optional dust collection system is available meeting the requirements for dowel pin drills found in Table 1 of the Occupational Safety and Health Administration (OSHA) final respirable crystalline silica standard when used with an appropriate filter. For more information, visit www.minnich-mfg.com.